Over the past calendar year, the thousand most popular home pages grew by 24.2% from December 2006 to December 2007, that is, from 250K to 310.4K (see Figure 2). At this growth rate the average home page will exceed 385K by the end of 2008. The number of objects grew by 14.5% in 2007 from 44.2 in December 2006 to 50.6 objects per page in December 2007. An October 2007 survey of the top 50 retailers revealed that the average number of objects per page was 60.5 (Flinn & Betcher 2007). With the average number of objects per page above 50, the latency due to object overhead now dominates most web page delays. 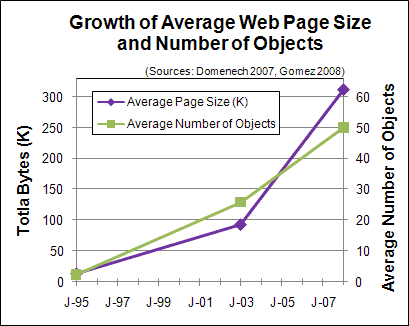 From 2003 to 2008 web page size has more than tripled and the number of external objects has nearly doubled. So narrowband users (56K and ISDN) have experienced slower response times over time. Conversely, broadband users have experienced somewhat faster response times over time. For broadband users the average download time of the Keynote Business 40 Internet Performance Index (KB40) has decreased from 2.8 to 2.33 seconds from Feb. 2006 to Feb. 2008 (see Figure 3 and Berkowitz & Gonzalez 2008). So the increase in the average speed of broadband has more than kept pace with the increase in the size and complexity of the average web page. That is one reason why broadband users expect faster response times. Yet narrowband users have experienced slower response times as web page size has increased.